When I was a kid, my mom used to laugh at me for yelling at the TV whenever I saw injustice playing out on shows. Yes, most of these shows were fiction, but I simply couldn’t stand the unfairness. One of my kindred spirits, a woman who could not tolerate injustice, is Eleanor Roosevelt. She died before I was born, but we share the same birthday, October 11, and I wrote a research paper on her, using astrology as the theme precisely because we share a birthday. Because of my dismay, I am compelled to do something. I have attended one town hall meeting this year. Now it’s time for letter writing. Specifically, writing letters to legislators. 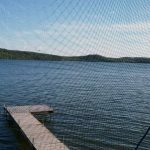 I’ve got a list of issues to address with both federal and state legislators, a list that seems to grow longer each day as the outrages our current government perpetrates on the American people stack up. The first issue I wanted to tackle seems like a tiny one, but it’s these tiny things that tend to lead to the larger erosion of our rights over time. In this case it’s the new mute button that’s been installed at the Minnesota Legislature. Ostensibly, this mute button is supposed to be used to keep order in the chamber by allowing the speaker to turn off all the microphones. According to KARE 11, the mute button was installed during the Capitol Restoration project in 2015-2016 and there are fears that it could be used by the majority party Speaker to silence the minority. The KARE 11 article indicates that Republican Speaker Kurt Daudt has already used it in this fashion. If I were watching this news story on TV, you can bet I’d be yelling in outrage at the blatant unfairness of the mute button, not to mention its squelching of Minnesota citizens’ opportunity to be heard through their representatives. We voters did not simply elect majority party members; we elected minority party members, too, with damn good reason. Governments need a mix of viewpoints to work properly for all Americans, not the ham-fisted, fear-based, authoritarian values that seem to be sweeping the country. Here is one of my postcards. (The other is identical except for who it is addressed to.) If the mute button and its potential for misuse bothers you as much as it bothers me, I encourage you to write postcards or letters to your legislators on the issue. Feel free to use some of my verbiage if it helps. 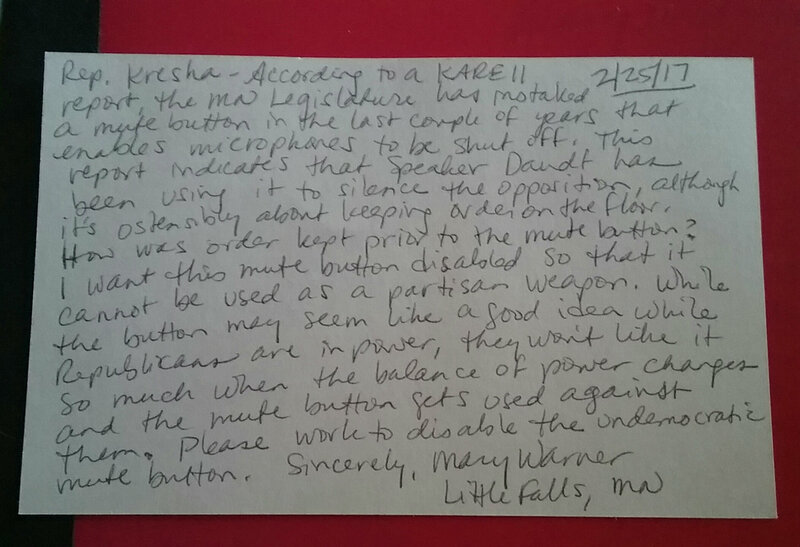 Postcard to Rep. Ron Kresha concerning disabling the mute button at the MN State Capitol, February 25, 2017.